100% pure-pressed organic mixed fruit juice. 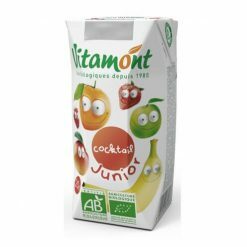 Located in south-west France, Vitamont produces a wide range of quality organic fruit juices. A group of organic farmers founded the company in 1985 and, just one year later, were able to meet the strict standards of organic certification as a manufacturer of pure, pressed juice. Today, the company remains committed to the organic movement, sourcing ingredients from organic farmers in about 100 locations across the country as well as other parts of the world for those fruits not available in France. Ingredients: Organic apple juice, organic orange juice, organic strawberry juice, organic banana juice, organic mango juice, organic raspberry juice.